The week before Thanksgiving we jumped into a huge project on a whim, a project that we’ve been thinking about since the first day we moved here – changing up the design of our fireplace. 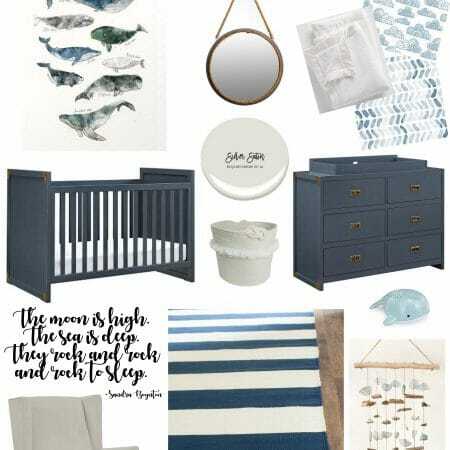 I’ve done most of the interior projects around here myself, but even with my Stubborn Irish-meets-Girl Power attitude I knew I would need some help on this one. Mark and I had done a TON of research on this remodel for the past 5 years and were feeling pretty confident about doing it ourselves, but held off because of the time commitment – exactly when is a good time to rip apart your family room?? Um – the week before you host Thanksgiving?? 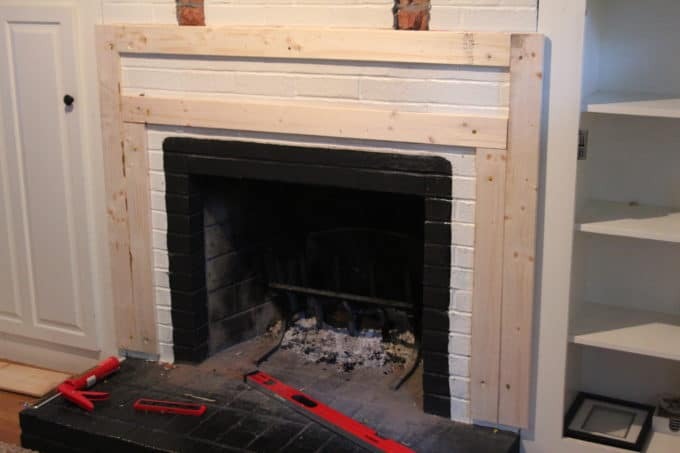 It was probably not the best timing, but when I casually mentioned to Mark that I’d love to do the fireplace project next, he got all fired up and took a sledgehammer to our mantel, and it was GAME ON! In the middle of December I shared an overview of the process, but there were so many parts to this remodel that I decided to break it down and share bits and pieces over the next few weeks for those of you who are thinking about a project like this in your own home. 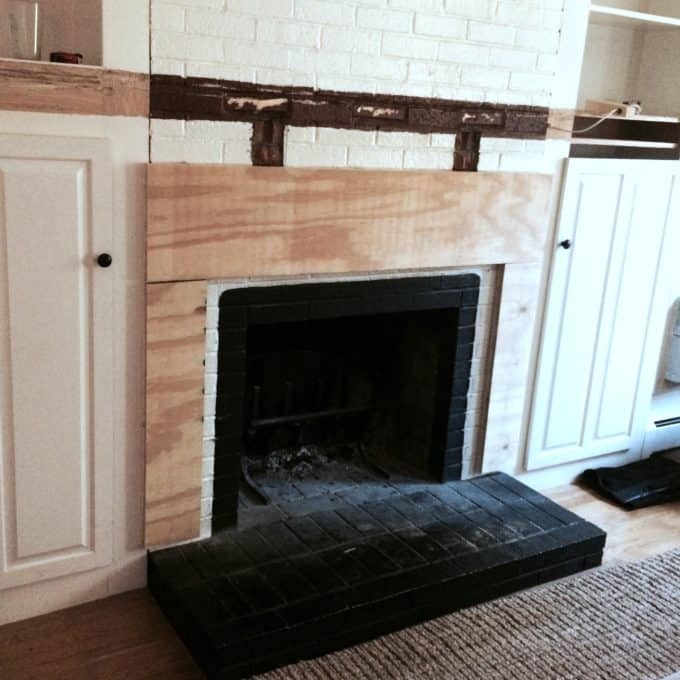 These posts I’ll be sharing about our fireplace remodel are for informational purposes only. Please read my Disclosure and Policies and exercise caution when undertaking DIY home improvement projects. Eye and ear protection are highly recommended. 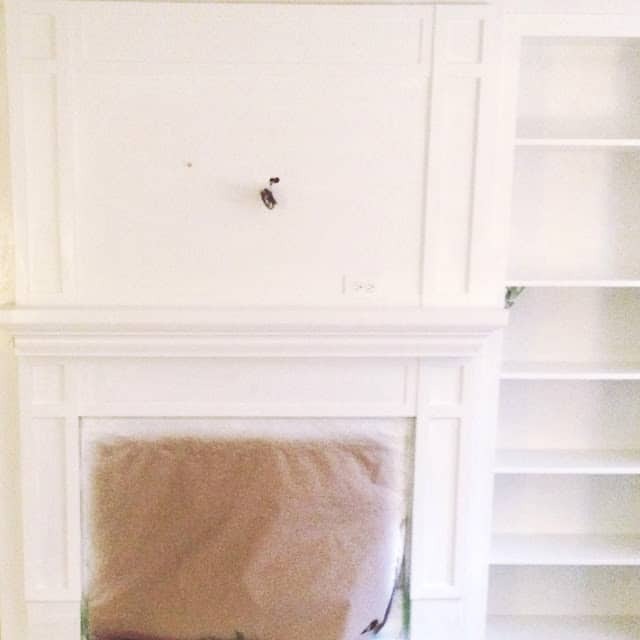 The quick scoop on where the fireplace started when we first moved in – oak cabinets and the famous peach paint. I primed and painted this along with all the orange trim in the house. but a few issues remained: the mantle was weirdly high, the cubbies on the top of the cabinets were awkward, and between two entrances into this room and two windows, there was no place for the TV. We made the decision to mount the TV over the fireplace after doing a LOT of research on the subject, and I’ll dedicate a post to that subject later for those of you considering this. 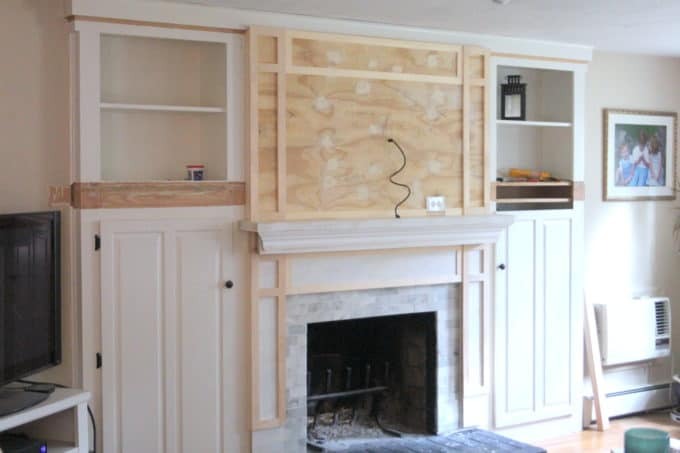 Our plan was to remove the existing mantle, modify the height of the cabinet doors, and change up the overall style while we were at it. The first thing we did was rip out the mantle with a crowbar, a sledgehammer and a lot of grunt labor. We also knocked out the brick corbels that were under the mantle by placing a chisel against the brick and hitting it with a hammer. The brick breaks apart in 50 million tiny pieces so it’s a good idea to put drop cloths around the work area and definitely wear eye protection if you are doing something like this. The demo alone took a couple of evenings. After the demo was complete we started reconstructing the fireplace surround, hearth and uppermantle (that is actually a word!). This is where all my Pinterest research and dreams of how we could transform our fireplace came to life, so very exciting!!!! Here’s the scoop on the reconstruction phase. 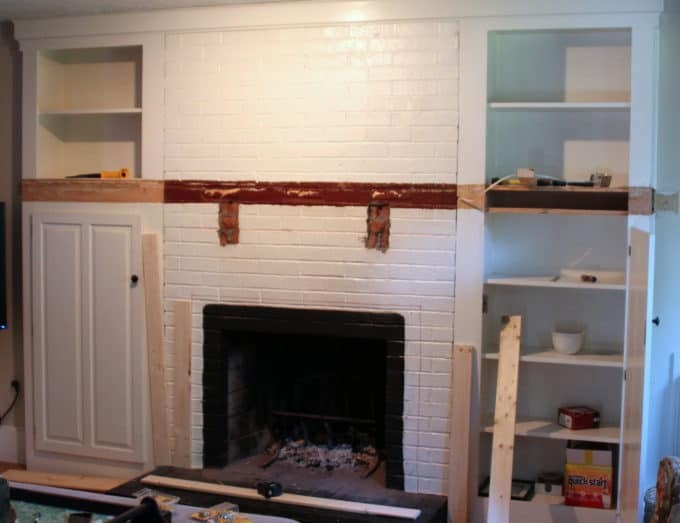 The first step to building out a new surround, mantle and uppermantle was to install furring strips to the brick. 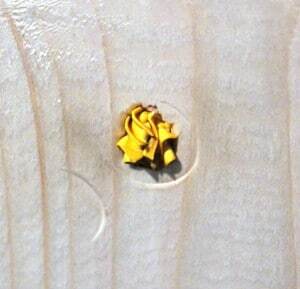 We did this using Liquid Nails and a powder actuated fastener that drives nails through the wood into the brick, and provides a really secure base on which to build. The tool is held up against the furring strip and hit with a hammer, and one of these nails is shot into the brick. 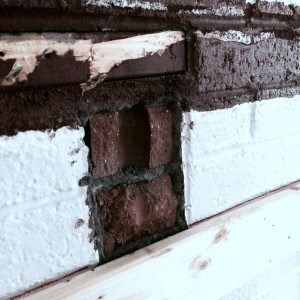 After the furring strips were installed into the brick we added plywood to the surround. 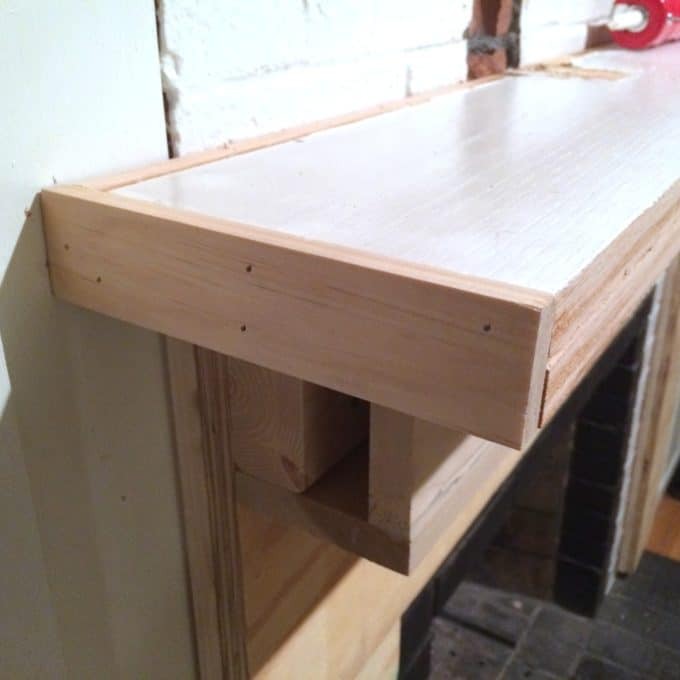 This is where we made our one BIG mistake of the whole project – even though we knew better, we used a piece of regular plywood we had in our garage for the surround that was not PAINT-GRADE plywood (like poplar, birch, or maple). Cheap plywood has a bit of texture and we thought we could hide it with priming and painting, but after it was all done, the texture is still apparent, so if you are building a fireplace surround I strongly recommend using a very smooth, high quality plywood! 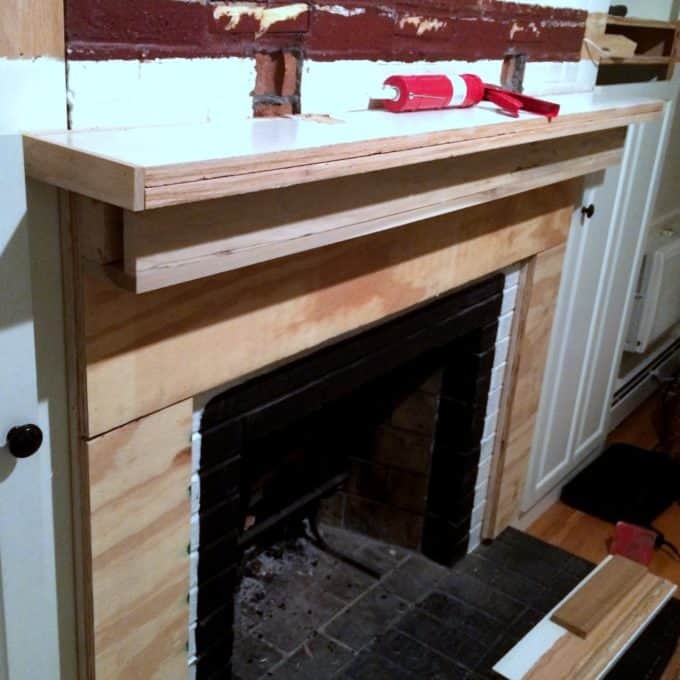 Note that the plywood does not come all the way to the edge of the fireplace box. In Massachusetts, fire code requires at least 6″ of brick or a non-flammable surface around the firebox – make sure to check your state’s fire code before starting a project like this. We also left room for resurfacing the hearth so the plywood does not come all the way down to the brick. After we had the surround base installed, we started boxing out the mantle. 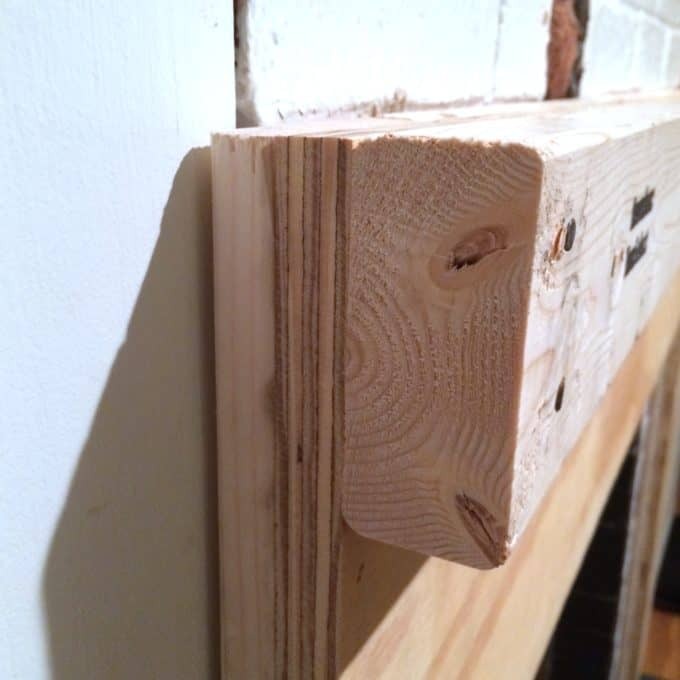 This photo below shows the layers of furring strip, plywood, and then a 2×4. Off of the 2×4 we built a box to give the mantle some visual weight, and cut down the old oak mantle boards to fit on top, layering 2 boards to create a nice thick top. All these pieces were attached with both Liquid Nails and a pneumatic nail gun, and we checked to make sure it was all level continuously. Then we trimmed the edges of the mantle for a seamless look. 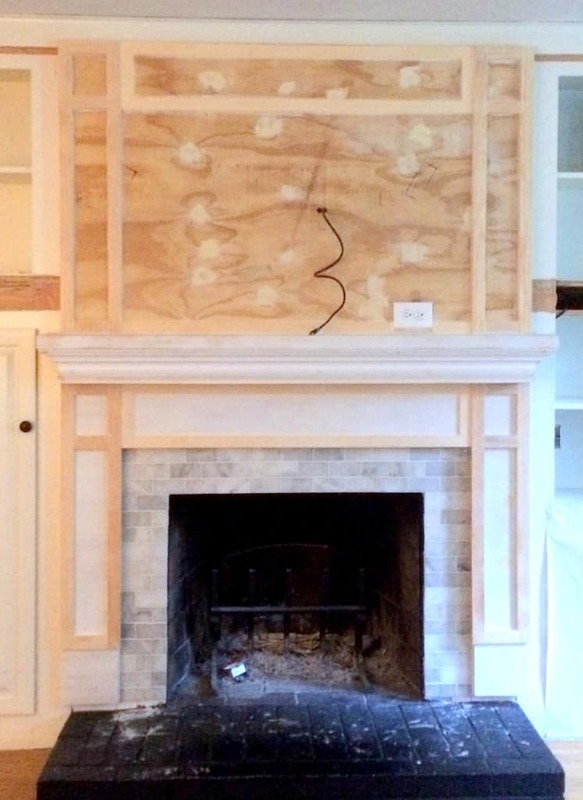 After we constructed the surround and mantle, we decided to added a piece of crown moulding to the front of the box. Since the top of the mantle was already attached, we couldn’t wrap the crown around the sides because it would have extended beyond the top. Instead we placed it just on the front and capped the ends with a return piece like I did on the chair rail on our built in bookcases. I know not everyone would choose to do this; it’s probably considered WRONG in the world of fine carpentry, but what the hey! The crown made a world of difference in the end result and we LOVE it – sometimes you have to fly by the seat of your pants with your DIYing! 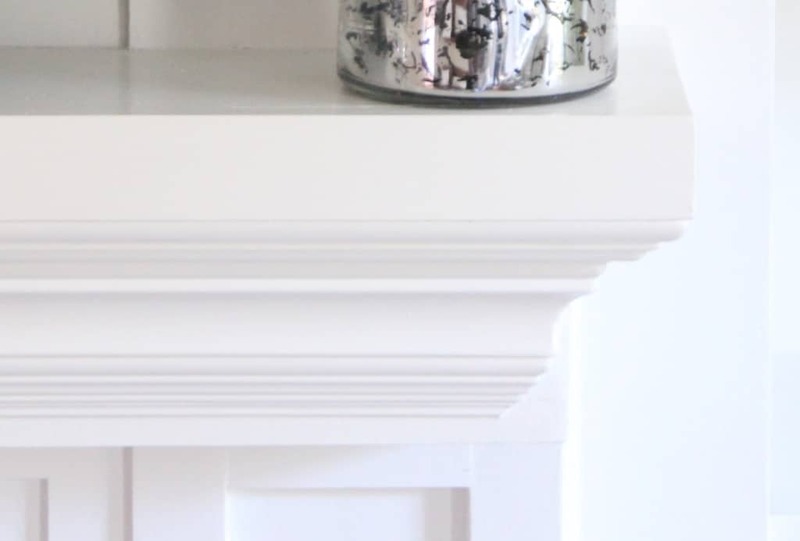 Here is the mantle all finished – I’m so happy with how it turned out! After the mantle was done we went through a similar process with the top of the mantle. The old mantle had an outlet in it, so we turned off the power when we demoed, took the outlet box and put it aside on one of the bookcases. Then when we got to this stage of reconstruction, we built it into the upper mantle so that it would be hidden by the tv (somehow I didn’t get a picture of this.) 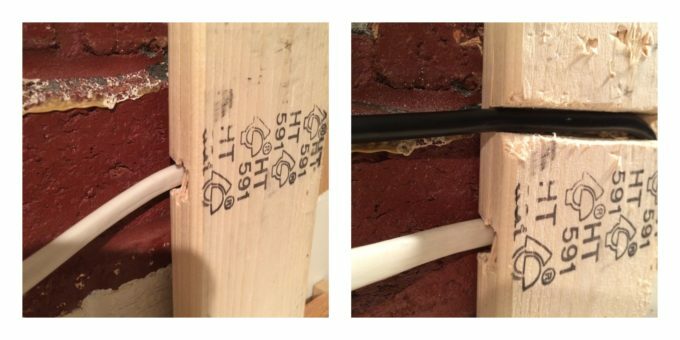 Before installing the furring strips to the brick, I made a route to run the cable wire through (the old fashioned way, with a chisel and hammer). After we had attached the furring we realized we needed to add another route for the HDMI cable so I chiseled out another channel on the front. These cables were plugged into the outlet, then run over to, and down through, the bookcase on the side where they meet up with the cable box. More on that later! 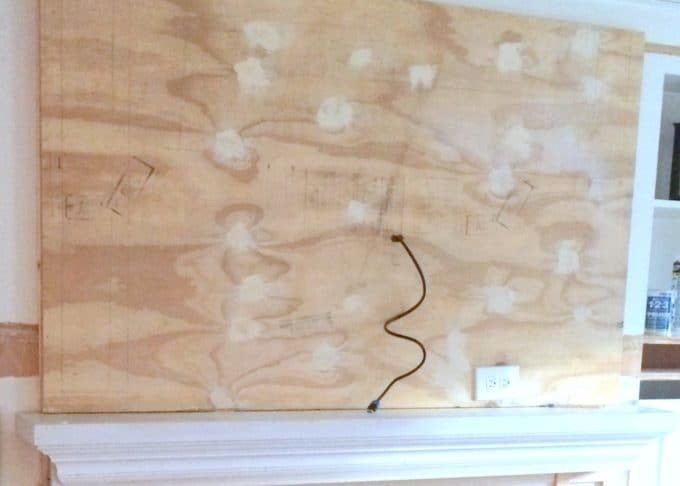 We cut down plywood to attach to the furring strips over the brick, and drilled a hole large enough for the cable for the tv to be pulled through, then we attached the plywood to the furring strips to create the uppermantle. After we installed this wood base to the upper and lower parts of the fireplace, I tiled the surround before moving on to the finish carpentry. Once the tile surround was done, I trimmed out both the surround and the uppermantle. To achieve inset boxes in the middle areas (both at the very top of the uppermantle, and right under the mantle, I used a thinner trim than the sides; it’s very subtle but gives a little more detail to the design. 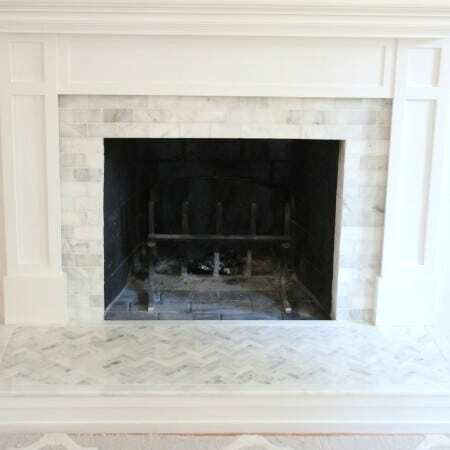 The trim hides all the seams on the bottom and really brings some depth to the fireplace. After adding the trim I caulked all the seams, filled the nail holes and attempted to smooth out the plywood for days on end. Prepping to paint takes so much time but is so worth it in the end!! I sanded and primed all the new wood. Homeright was gracious enough to send me a Finish Max sprayer, so I taped off the fireplace box and taped drop cloths all around the area – the walls and floor – then sprayed the new surround, mantle, uppermantle and bookcases with a few light coats to achieve a really nice smooth finish. The sprayer is amazing at getting into all the nooks and crannies of the trim and bookcases! 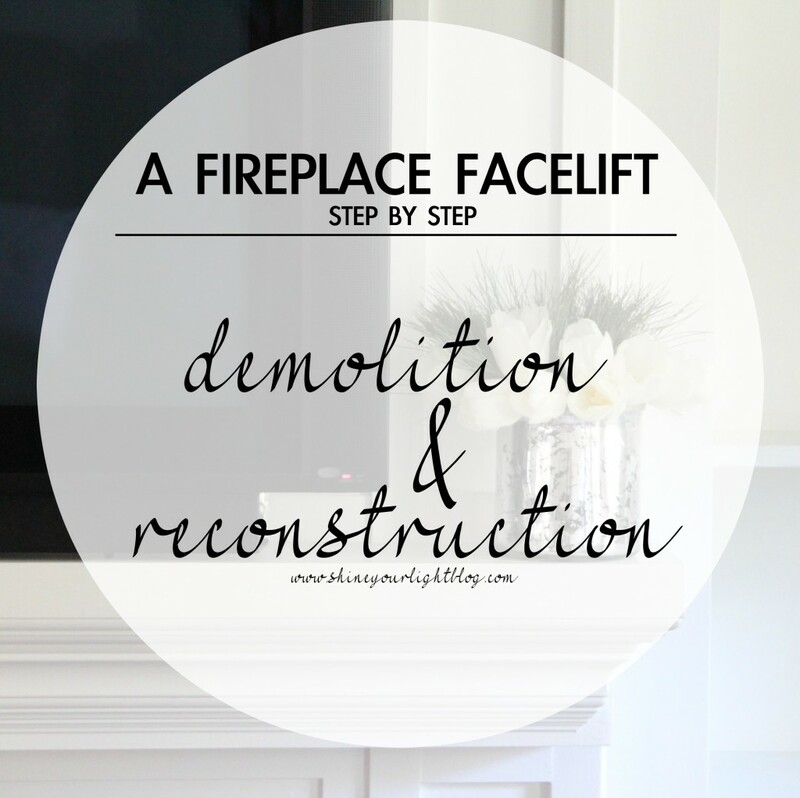 That’s the scoop on the demolition and reconstruction of the fireplace. There is so much more to this project – it was a ton of work but truly one of my favorite home improvement DIYs to date! Look for these upcoming posts that break down the whole process from start to finish! I’ll be back next week with another edition of the fireplace files! 1. I would make a terrible construction estimator. 2. DIY is hard work, but the results must be very satisfying. 3. If we ever tackle this project at our house we will probably have to hire it out. 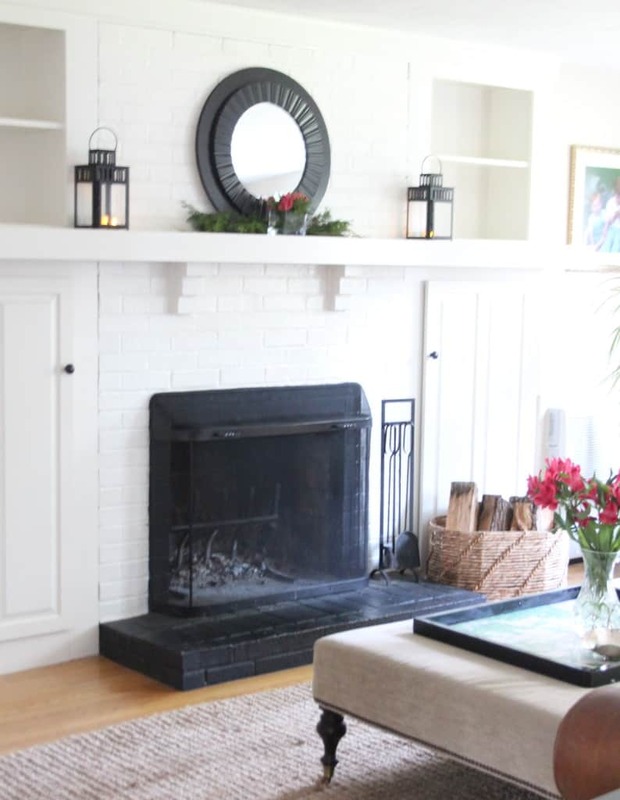 I know our fireplace project was the biggest DIY project we’ve ever tackled, but the end result is so worth it! I’m amazed at all that you’ve tackled here, Lisa! It looks spectacular! Thanks so much Jenny! I’m glad we finally dived into this project! holy wow you are amazing!!! and YAY you are in bloglovin again! Thanks Lianna! I am looking forwarding to seeing your new mantle!